Get so caught up with weekend eventing action that you totally forgot about fall’s biggest horse race, the Breeders’ Cup Classic? 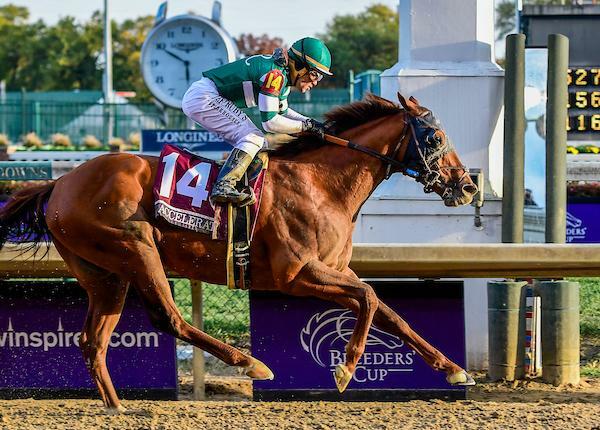 No judgement, and for your recap convenience, a quick summary: Capping off a nearly-perfect season, Accelerate was the toughest of them all in the $6 million race held Saturday at Churchill Downs. Thankfully our friends at Horse Nation have done a bang-up job covering the Cup — here’s a replay, and visit the site for more including this photo gallery of Breeders’ Cup jockeys’ winning moments, this embarrassing report about the Cups’ token drunk dude, and an inspiring feature on the New Vocations Breeders’ Cup Pledge program. Accelerate, ridden by Joel Rosario, wins the Breeders’ Cup Classic on Breeders’ Cup World Championship Saturday at Churchill Downs. Photo by Jessica Morgan/Eclipse Sportswire/CSM. In a year that felt strangely empty with the early retirement of the Triple Crown winner Justify, a 5-year-old named Accelerate stepped into the void and grabbed the championship for himself: winning five of his last six starts, the chestnut son of Lookin At Lucky made Saturday’s Breeders’ Cup Classic his sixth Grade I victory of 2018. Accelerate was trainer John Sadler’s 45th Breeders’ Cup hopeful, and his victory broke one of the most infamous losing streaks in Breeders’ Cup history. He went off as the favorite in a star-studded field including Dubai World Cup winner Thunder Snow, UAE Derby winner Mendelssohn, Travers winner Catholic Boy, and 2017 multiple Grade I winner West Coast. Mendelssohn set a grueling early pace that sent murmurs through the crowd as the fractions flashed up on the screen, with McKinzie and West Coast in hot pursuit and Thunder Snow lurking on the rail. Accelerate, under a ride by Joel Rosario, had to hustle from post 14 to make up some ground and settled clear mid-pack. Into the home stretch, Mendelssohn tried his best to hold on but faded, leaving the door wide open for Accelerate to sweep three-wide on the turn and take command of the race. He held off challenges first by Thunder Snow and then by characteristically late-closing Gunnevera to cruise under the wire the latest Classic champion. A fascinating debate now unfolds over who should earn Horse of the Year honors: Justify, the undefeated unraced-as-a-two-year-old Triple Crown winner who retired in the first half of the year due to injury, or Accelerate, who won six Grade I stakes in California and then beat the best of the East Coast in the Classic? Weigh in with your thoughts!